​Graphic Design, Signs, ​& Banners. 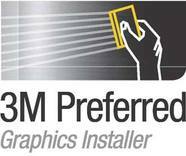 3M recognizes Surf City Graphics as accredited professional graphic installers. Being a 3M Preferred Graphics Installer demonstrates our commitment to providing you with the best graphics installation available. Why trust your brand identity to someone else when you can trust that a 3M Preferred Graphics Installer has been professionally accredited to do it right.